Food is our medicine if we plan our meals with awareness and consume it with care. Vegetarian diets are gaining popularity, and the reasons for following a vegetarian diet can be related to economical, ecological, social, and health concerns. Let’s explore how to thrive on a vegetarian diet. The word ‘vegetarian’ is not well-defined. It includes people with varied attitudes and eating behaviours with respect to foods of animal origin. Vegetarians all focus their diets primarily on plant-base foods, but there are different levels of vegetarianism according to how much animal products they consumed. A ‘vegan‘ eats only foods of plant origin. Are you a vegetarian, or thinking about becoming one? If so, there are pros and cons that you should be aware of. However, a poor vegetarian diet that relies too heavily on processed foods can means consuming excess calories, sugar, trans fat and sodium. “In the past, vegetarian diets have been described as being deficient in several nutrients including protein, iron, zinc, calcium, vitamin B12 and A, n-3 fatty acids and iodine. Numerous studies have demonstrated that the observed deficiencies are usually due to poor meal planning.” A poorly planned vegetarian diet could easily lead to anemia, hypoglycemia, hormonal imbalance, diabetes, dental problems, or osteoporosis due to vitamins, minerals, and EFA deficiencies. A well-planned, balanced vegetarian diet means to include wide variety of fruits, vegetables, whole grains, legumes, and healthy fats. *** For those of you who have specific food allergies or sensitivities, please work with your holistic health practitioner to tailor an individualised food plan. It is not uncommon in my clinical experiences that individuals following a seemingly healthy vegetarian diet struggle to experience vitality until we identified their food sensitivities and eliminated those “healthy” food. Lucretius Carus is correct in stating, “What is food for one man may be bitter poison to others”. As we have discussed, it is extremely important to have a balanced vegetarian diet. 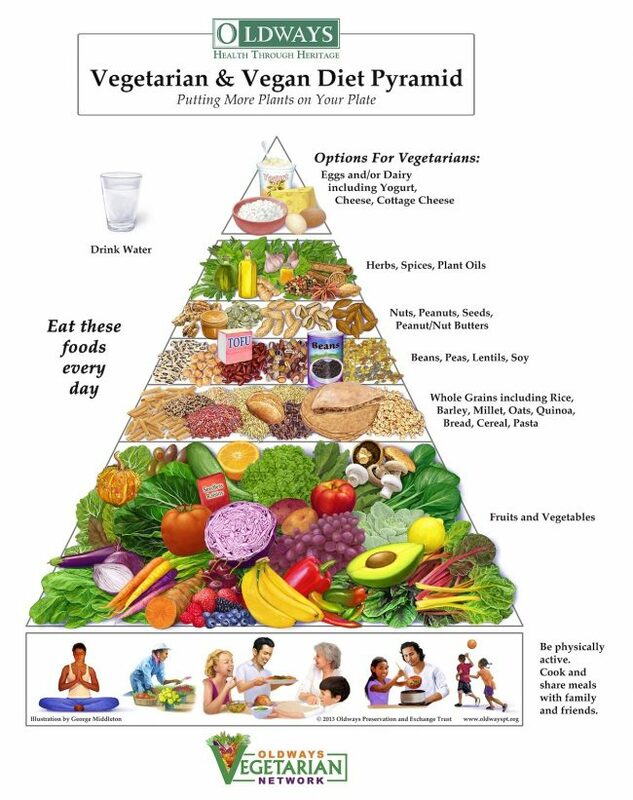 I found the Vegetarian & Vegan Diet pyramid presented by “Oldways Health Through Heritage” a good general guide for a balanced vegetarian diet. Vegetarian Health Institute – a new nutrition guide called, “How Vegetarians Get Calcium, Iron, Protein, A, B12 & D.” is yours for FREE, thanks to The VegHealth Institute. Another easy guideline to ensure a balanced vegetarian diet is to adopt the rainbow diet. The colors from fruits and vegetables reflect the micronutrients they contain. Vitamins and phytonutrients are responsible for providing these colors vary in each and every plant source. 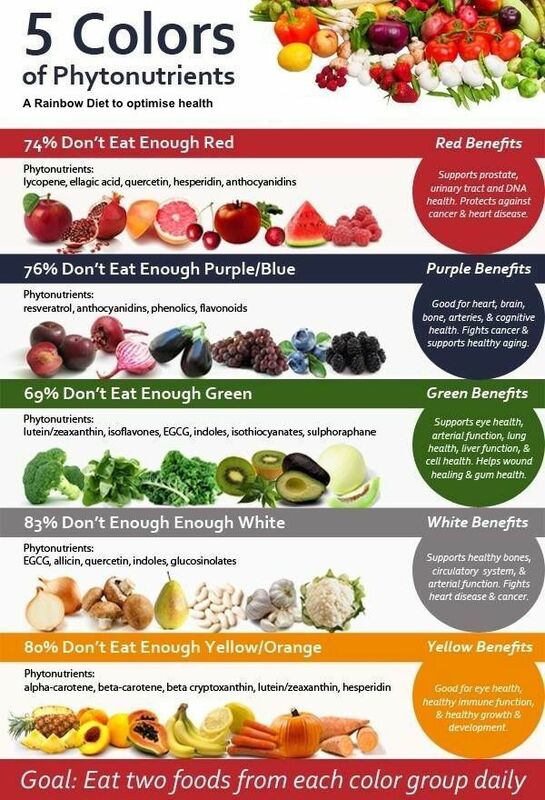 This is why it is so critical for you to eat all the colors of the rainbow. 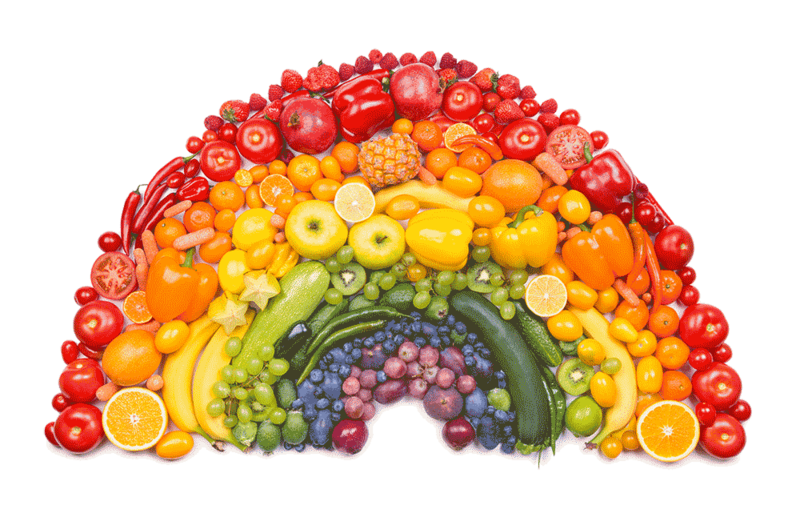 A “rainbow diet,” meaning a diet abundant in all the nutritional colors (i.e. yellow, orange, red, green, blue, indigo, purple) is essential for optimal health. The nutrients you’ll receive from eating the nutritional rainbow act as powerful antioxidants that inhibit oxidative cell damage and promote cell regenerations. Enjoy your food as medicine. Divisi, D., Di Tommaso, S., & Salvemini, S. (2006). Diet and cancer. Acta Bio Medica Atenei Parmensis, 77(2), 118-123. Leitzmann, C. (2005). Vegetarian diets: what are the advantages?. In Diet diversification and health promotion (Vol. 57, pp. 147-156). Karger Publishers.